Stairs can be classified into open risers or closed risers. 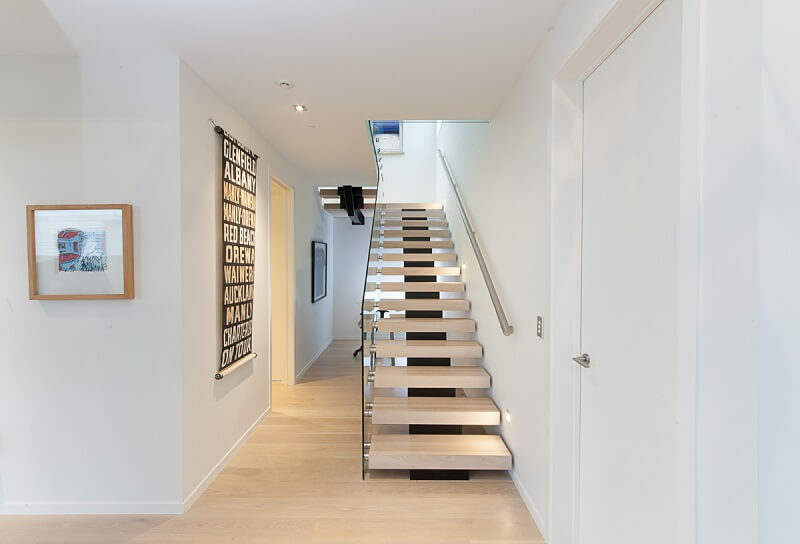 Open risers, also known as floating stairs, have a vertical space in between adjacent treads, while solid risers are the conventional option, in which there is a solid piece that encloses the stairs between the treads. While both options have their advantages, open risers, in particular, are gaining in popularity. This is especially true in modern homes. Floating stairs are attractive to architects and homeowners alike because of their versatility and pleasing aesthetics. One of the greatest advantages of open risers is that they allow more light to enter the building. This increased transparency complements open floor plans, which are becoming an increasingly popular feature of modern homes and offices. Open risers look great with open floor plans because they do not interrupt lines of sight, making an area look larger. Conventional stairs tend to create shadows and leave a dead space underneath. On the other hand, open risers allow light to pass through, which lets you make greater use of the space underneath. You can even use the floating stairs for exteriors – it is not uncommon to place flowerbeds or other decorative elements underneath the stairs themselves. Open risers have a sleek, modern look that enhances the beauty of your home. They are more versatile than conventional stairs because you can redesign it to fit just about any configuration. Solid risers can be straight, curved, or even spiral. They can be made of just about any material too – you can get it in steel, granite, or wood. Wooden steps are an especially attractive option, as you can use beautiful local materials, such as New Zealand timber. Ackworth House has many different high-end open risers available. Choose from a range of styles, such as our Centrum, Suspendo, Dualis, Lateralis and more. Each one offers its unique flavour and adds refined appeal to just about any space. For more information on our floating stairways, contact Ackworth House today.